Years of brutal war in Europe had left the continent in ruins, millions dead and the survivors traumatised on a scale impossible to comprehend from this point in time. An uneasy consensus prevailed between the Allied powers who now occupied the broken continent between them. Advances in weapons technology had blurred the boundaries between military and civilian targets (as in the case of aerial bombing), while the brutal racism of the Nazi regime meant that it had engaged in widespread brutality and executions to terrorise the populations of countries they occupied. Then there were the concentration camps set up for slave labour and genocide. While many at the top of the Nazi hierarchy had either been killed or committed suicide, others from the higher echelons of the ruling regime, directly implicated in these brutal practices, had been captured alive. This posed a dilemma for the Allies – what was to be done with them? Justice for the millions killed was called for. But for countries that had fought under the banner of freedom from Nazi tyranny how this could be achieved was a major problem. This was complicated by the fact that the Nazis had been adept at using show trials during their ascent to power to discredit their opponents. Similarly, Stalin (whose representatives now sat in judgement on the Allied side) had used sham trials for the same purpose during the 1930s. The question was how to ensure that any trial of the captured Nazis avoided being seen as such and prevented the creation of martyrs for the future. It was imperative that the trials were seen as both legitimate and impartial. The Nuremburg trials of 1946 also served as a platform to completely discredit the hideous Nazi ideology and war aims that had seen millions killed and a continent reduced to smouldering rubble. The outcome of the trials was predictable enough – many of the defendants were found guilty and executed, while others were given long terms of imprisonment. But by this time, the Allied consensus was already falling apart and the Iron Curtain was being drawn across Europe. Further trials for middle-management Nazis who had also been implicated in crimes were shelved as both sides chose to employ their expertise rather than hang them. This then was the background to the two photobooks under discussion. 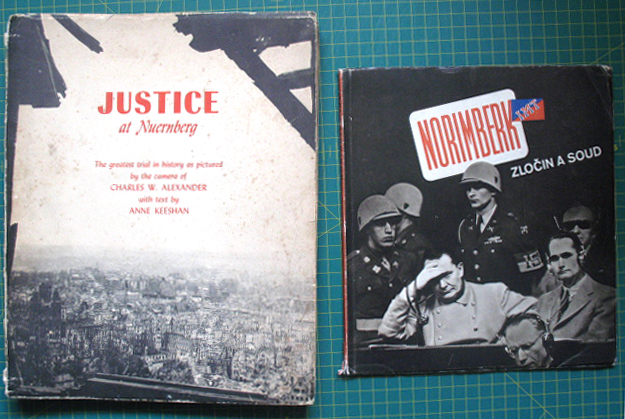 The first is Justice at Nuernberg by Charles Alexander, an American photographer (listed as being director of photography during the trial) with text by Anne Keeshan. 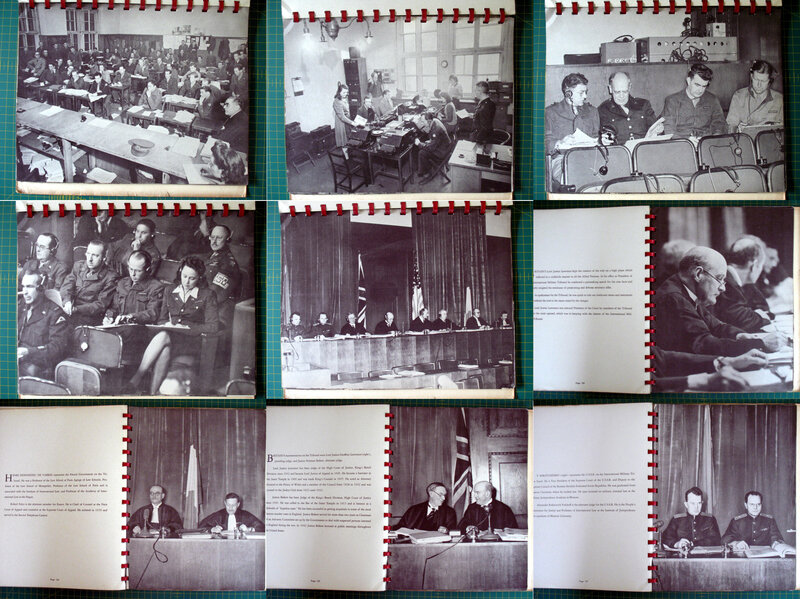 This spiral bound paperback published by Marvel in 1946 is a very comprehensive documentary record of the whole International Military Tribunal process, employing a straightforward layout of photograph on the right hand page with an extended caption on the facing page. 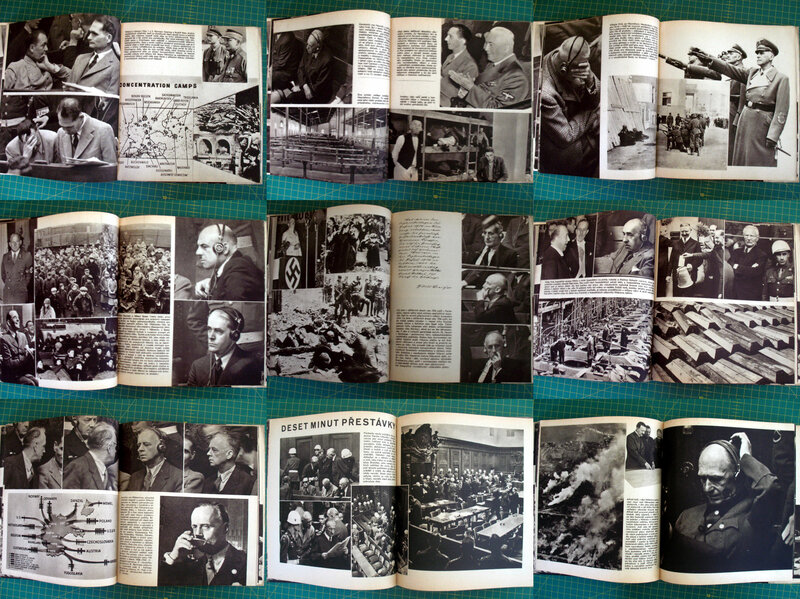 The book begins with an overview of the ruined city of Nuremburg and the Palace of Justice that hosted the trials (in the American sector of occupied Germany), the facilities for the news media, portraits of the Nazi leaders on trial, the vast behind the scenes complex of translators, archivists and typists, portraits of the prosecutors and judges, as well as the trial process itself. 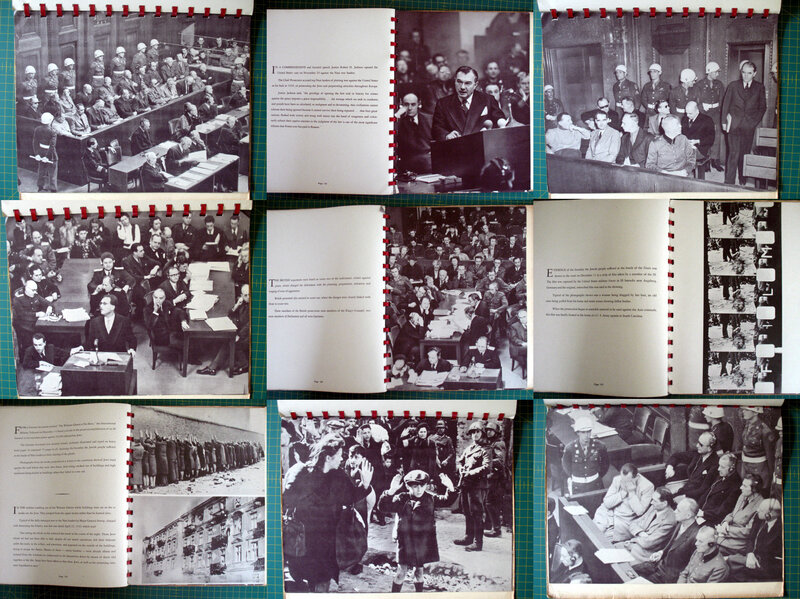 The final section of the book shows the Nazi leaders in the dock looking horrified as they are confronted with evidence of their crimes in the movie created by the prosecution from German newsreel and other archival footage, The Nazi Plan. The book’s narrative and photographic sequencing is quite slow. 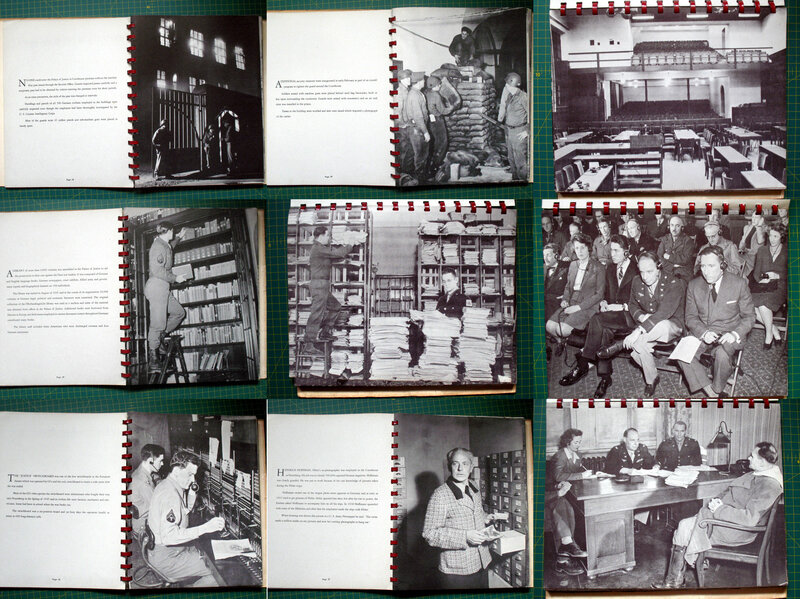 Much of the imagery focuses on a behind-the-scenes look at the trial infrastructure, with photographs of the press facilities, the library, Heinrich Hoffmann (Hitler’s personal photographer) going through his archive to find evidence for use in the trial, depositions being taken and other such imagery. The individual portraits of the Nazi defendants appear to have been made while they were in the courtroom. These portray them in awkward poses in which their facial expressions range from sneering contempt, anger and malevolence. These images are in stark contrast to how the judges and the rest of the staff are portrayed. 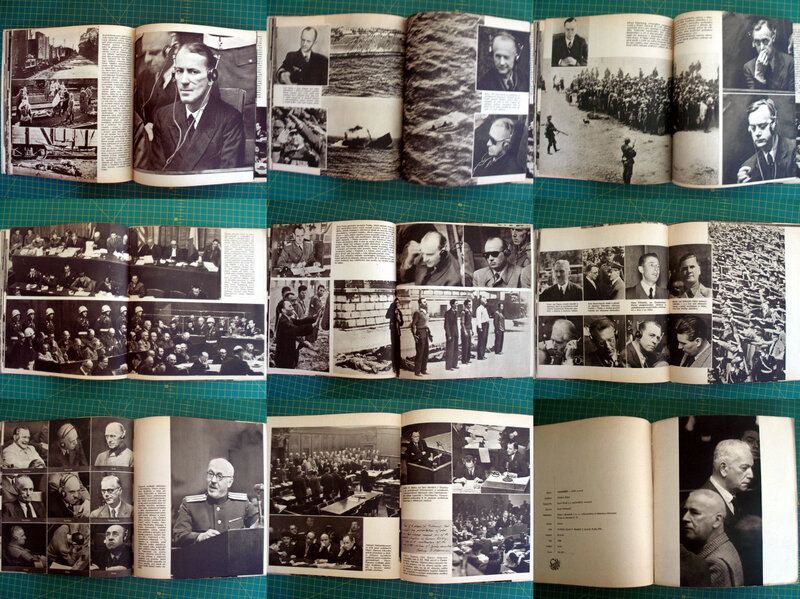 The final section of the book attempts to convey a sense of drama as the trial gathers pace and the evidence is presented to the Nazi defendants. Alexander does this by interspersing four archival images of Nazi crimes (from the Nazi Plan) with images of the defendants sitting in the dock. However, it doesn’t convey the drama he is seeking to produce; it’s too static. Although the trial is supposedly the focus of this book, a relatively small amount of space is devoted to it. Instead, the organisational and logistical preparations consume much of the book and distracts from the magnitude of the trial itself. Similarly, the book finishes rather abruptly. 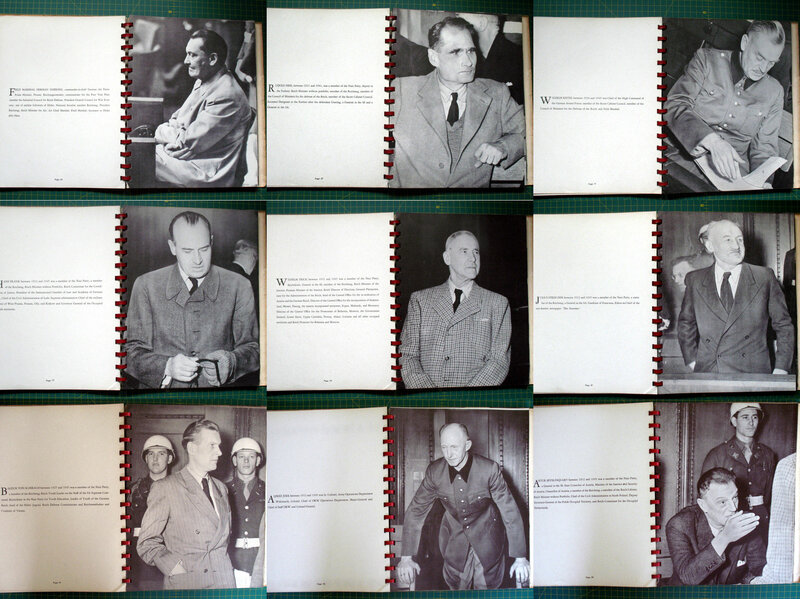 The final image shows yet another photograph of the defendants in the dock, with Goering holding his hands over his eyes, captioned as showing the differing emotions experienced by the Nazi’s as their crimes are finally exposed to the world. But then the book just stops. Robert Jackson, the chief American prosecutor, contributes a forward to the book in which he states that “the accusers were four victorious nations which had it in their power to execute the defendants without trial but which considered it more in keeping with the principles for which they fought to give the defendants the benefit of hearings and to establish before the world their guilt.” Here, I think, is the main purpose of the book. Jackson, a former U.S. Attorney General and Supreme Court Judge, was well aware that these trials had to be seen as fair and conforming to the broad principles of justice expected from an American audience. Any sign that this was a kangaroo court had to be quashed. Similarly, in the context of a rapidly emerging Cold War split in which America presented itself as a bastion of liberty and freedom, the book presents the decision to hold these trials as proof of U.S. moral rectitude in contrast to the behaviour of their barbaric Nazi enemies. In this context, the focus of this book on the preparations and infrastructure surrounding the trials makes sense. Here, a distant American audience is presented with a courtroom setting in which right prevails over wrong and justice has been served. 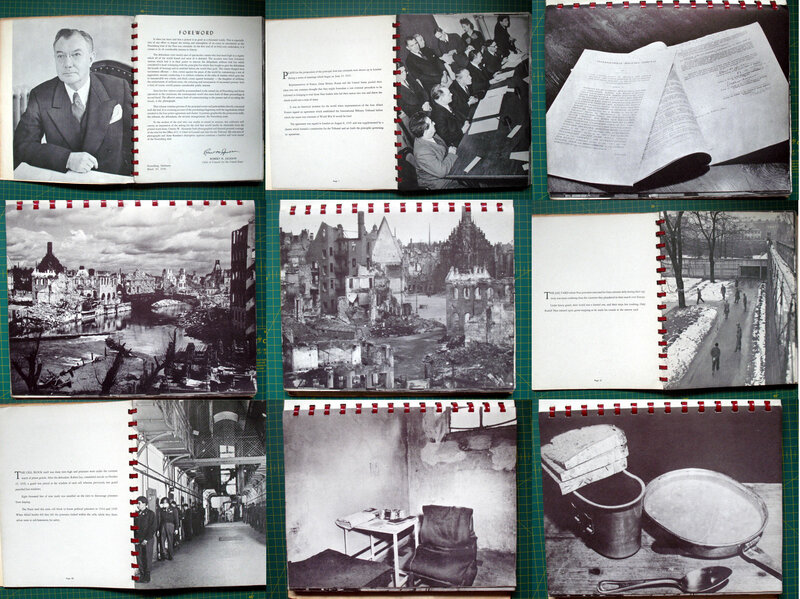 The second book on the same subject by the Czech photographer Karel Hájek, Norimberk 1946 – Zlocin a Soud (Nuremberg 1946 – Crime and Court), a small paperback printed by Neubert in Prague, is another photographic representation of the same event. However, this book takes a wholly different approach towards documenting the trial. In part, I believe this can be traced to the fact that Alexander was producing a book for an audience who, while they had fought the Germans, had no direct experience of Nazi rule. This was not the case for the Czechs who had suffered many years of brutal Nazi occupation. The establishment of precedents for future international war crimes trials was not a concern for a small country left traumatised and shattered by war. For a Czech audience, this was no abstract exercise in the administration of justice. Hájek gets straight to the point; his focus is on the evidence against the accused. He skilfully combines archival images of the same Nazi leaders at their height of their power, smartly dressed in uniforms and gold braid surrounded by saluting crowds or shown consulting with Hitler, with photographs of the same individuals in court. Now they have been reduced to the status of prisoners desperately trying to justify their complicity in unspeakable crimes. 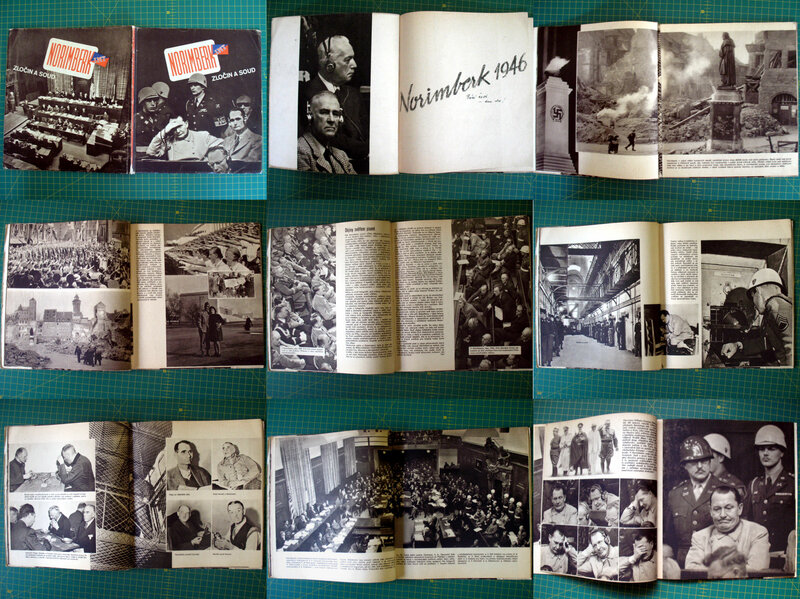 In one telling double page spread, Hájeck juxtaposes an archival image showing two lines of seated Nazi officials in 1938 with a photograph made from a similar viewpoint showing two rows of the same individuals now on trial in the same city. The portraits from the trial have been carefully chosen to present the accused Nazis as figures of derision, now stripped of the trappings of power they once wielded (undoubtedly a very satisfying sight to those who had suffered through Nazi rule). Like Alexander, the portraits Hájek made during the trial emphasise the obvious discomfort and haunted demeanour of the accused, presented as evidence of their guilt as they confronted by the enormity of their crimes. But it is his integration of archival images of atrocity with these portraits that is so effective. The need to establish a causal link between those at the top and the atrocities perpetrated by Nazi functionaries was vital. In essence, the Nazi leadership argued that because they were in their Berlin offices they could not be held responsible for what their subordinates did in Auschwitz or other sites of horror. Hájek’s book is very effective in undermining this argument and establishing a direct causal link between those on trial and the crimes perpetrated during their rule. Establishing this link between the decisions made by those in charge which were implemented by their subordinates was vital in order to discredit the “just following orders” defence which is a seminal feature of the bureaucratisation and division of labour inherent within all forms of industrialised warfare and mass killing to this day. An atrocity can be regarded as the result of a chain of decisions made by various individuals within a hierarchy (largely defined by institutional and political prerogatives) who all bear responsibility for the commission of a horrendous crime. Alexander’s book fails to do this. Instead, his focus is upon the structures and procedures of the trial itself which produces a simplified message in which justice is seen to prevail. He fails to interrogate the “banality of evil” as Arendt called it. In contrast, Hájek firmly and unequivocally undermines the excuse of distance used by the Nazi leaders on trial. Coming from a small country that had experienced the direct effects of Nazi rule for many years, Hájek produces a sophisticated and nuanced narrative of the trial in which he explores issues of culpability, guilt and responsibility in the aftermath of a period of untold suffering and death.